When you plan on seeing a musical with the word "zombies" in the title, one naturally enough expects comedy. Most likely a spoof, a parody or satire of some kind. When done well, the result carries a special delight. But when not done right...well, oh dear. Fortunately Visceral Company's Zombies From the Beyond pretty much hits a bulls-eye! Parody requires a precise mind-set, one that takes itself seriously while intending to be funny. Ninety-nine times out of a hundred, the best examples spring not from contempt but affection. 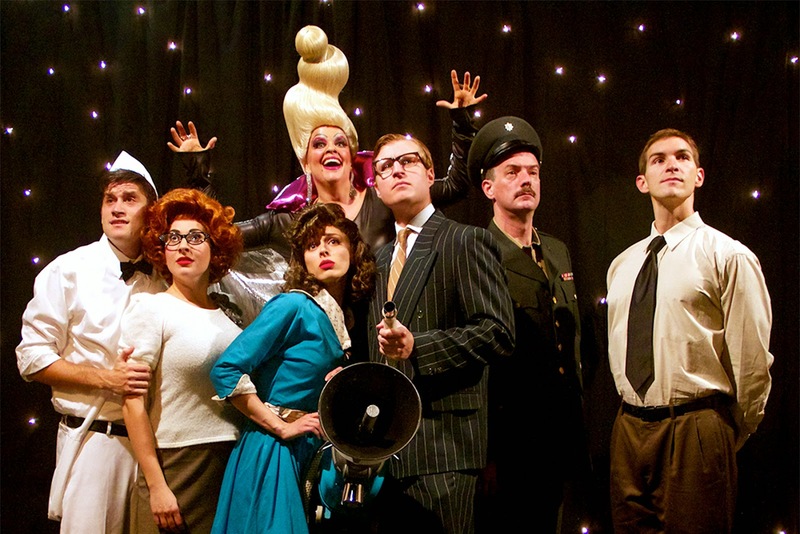 More, it needs a strong sense of precisely what it is the parody aims for! In this case, the target are those wonderfully cheesy 1950s UFO movies a la Earth Vs. The Flying Saucers, This Island Earth, Plan Nine from Outer Space, etc. But of course a genre is not really something to be mocked, not really. Not successfully. The real target is what lies behind the genre, the assumptions around which the genre grew up. More than anything else, this musical skewers a very narrow, complacent world-view which made up the absolute norm in the period of the show (a picture of President Eisenhower even hangs on the wall of the Space Center where the story begins). One far from gone, since the plot of Zombies From the Beyond bears more than a passing resemblance to that of the motion picture Independence Day! A flying saucer approaches the planet and comes to hover above a beauty salon. Aboard the ship is Zombina (Alison England), last living survivor of an alien world where women sparking a nuclear civil war by demanding equal rights. She has used her technology to reanimate the females of her race, but now she needs males, of which humans seem an excellent source! Cue diabolical laughter! Opposing these nefarious plans is Major Malone (Frank Blocker), his extremely multi-talented and big-skirted and chirpy daughter Mary (Amelia Gotham), Rick (Eric Sand) the Major's second in command with an invisible but unmistakable stick up his rear, Charlie (Lara Fisher) the Major's man-hungry secretary, Professor Trenton (Daniel Jimenez) of the square jaw and broad shoulder and uncrackable face, and of course Billy (Alex Taber) the young man who delivers the sandwiches! Already, you can tell this will either be Rocky Horror delightful or Scarey Movie 5 dreadful beyond words. Happily this turns out to be an almost textbook example of what a parody should be--the tropes taken to their logical conclusion or turned on their head to make their silliness clearer, the surprises that pop up yet make perfect (and hilarious) sense, the overdone nature of everything from Charlie's hair to Mary's reaction when someone is busy to the complete wrongness of the military uniforms and the fact the rest of the country never seems to respond to aliens invading an American city! The songs and musical numbers all fit together in marvelous, period sort of way (some of them very much non sequiturs that somehow "feel" spot on). I ended up feeling deprived, not having heard of this show before! No less wonderful, though, are the cast and production generally. Diving into such an arch style with fearlessness and bravura is the other half needed to make such a show work. Having seen all but one of this cast in other works, I had little fear of failure in that regard. Blocker and Gotham in particular deserve great big shout-outs (as they usually do) for their energy, talent and successful over-the-top interpretations. Miss England I was not at all familiar with but am extremely impressed with, and count myself her fan. I even went through her entry in the program, noting with approval her previous roles while wishing I'd seen them! 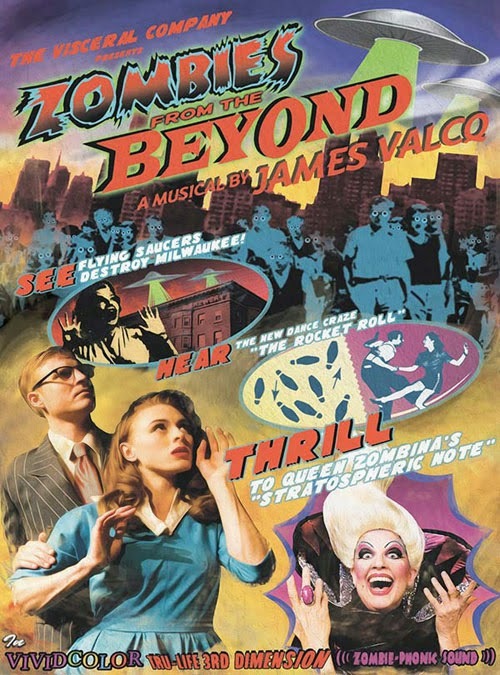 Zombies From the Beyond will play Friday and Saturday evenings at 8pm and Sunday matinees at 3pm from May 30 through July 20, 2014 at the Lex Theatre 6760 Lexington Avenue, Hollywood CA. Tickets are $32 for general audience and $25 for students with ID. Very good, straight-to-the-point review that I've come to expect from your virtual pen, Mr. Blue :-) Keep up the good work, meaning here the good and incisive reviews!